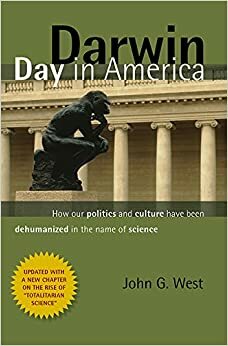 * Dr. John West on Totalitarian Science: Discovery Institute senior fellow Dr. John West, author of Darwin Day in America: How our politics and culture have been dehumanized in the name of science, speaks with Real Science Radio host Bob Enyart about the rise of totalitarian science. As the culture increasingly looks to science for moral guidance, America is in a moral free fall, for the scientific laws have no moral component and do not even use the words right and wrong. * ID Interviews on RSR: Hear also Paul Nelson, Stephen Meyer, Jonathan Witt, Lad Allen, and Richard Sternberg. * Recalling Last Year's Alaska Science Cruise: On a real Science Radio program in 2014 Bob gave to his co-host Fred Williams a debrief on the Discovery Institute's cruise to Alaska which Bob benefited from immensely with great presentations from John West, Stephen Meyer, John West, Paul Nelson, and Oxford's John Lennox. Today's Resource: You're invited to browse the Science Department of our Real Science Radio store online at store.kgov.com or call to ask about our fun audio, literature, and video resources, at 1-800-8Enyart (836-9278). * Announcing Upcoming King James Only Debate: Bob Enyart and Will Duffy, of Denver Bible Church, will be debating a leader in the King James Only movement, Colorado's Will Kinney. The five-round written debate will take place on TheologyOnline beginning Monday Nov. 2 and is titled: "Is the King James Bible the Only Inspired Scripture on Earth Today? Battle Royale XIV". We'll use kgov.com/kjo to keep you updated, and you can click here for KJO Debate Countdown Clock! * If you live in Colorado, contact service@kgov.com to find out about our Monday night preparation meetings. * If you are known to the BEL crew and want to help with research (reading/viewing videos/etc) email Bob@kgov.com. - DONE! As of Sept. 11, 2015 we have rec'd all reference books needed for the debate that we listed at KGOV's Amazon.com Wish List. (There's one more book needed, but it's expensive, and it's for our important research site, 360dayyear.com.) Thank you guys! - Helping to finance our travel to England. [Update: This trip was wonderfully successful! - B.E. & W.D.] This is a tough one, we know, because it seems like it'd be financing someone's vacation, except that, while this will be a wonderfully enjoyable trip, this is no vacation but an extremely valuable project. Our ongoing debate research is leading Will Duffy and Bob Enyart to travel to England beginning on September 13th to access documents otherwise unavailable to the public. Regardless of how fun the trip seems, Will had to insist that Bob join him, for there is a possibility that if this research goes well, it could add real value to the collective knowledge of the Body of Christ about church history regarding Bible translation. So please consider helping by calling 800-8Enyart (836-9278) or consider giving online. Thank you SO much! * Please pray that the correct side in this debate will prevail and that this will become a leading resource for those involved with this controversy. * P.S. To make full use of our time in England, our Real Science Radio producer has also arranged for Bob to interview in person professors from the University of Liverpool and the University of Leeds. So please pray too for the effectiveness for these toward the saving of souls and the further equipping of believers to share the Gospel!